Ruanel: There is a very cruel issue, so to speak. All the Masters of Light suffer when they perceive the suffering of embodied beings. The cruel thing in the case of the conjoined twins is that they come in one body. Obviously there are two thetans, there are two embodied 10%, and of course they don't have private lives because they share a body. Interlocutor: Okay. The question is how the spirit is inserted or incorporated in the cardiac part, I don't know if it’s fine saying it like that, in the area of the heart, if they are conjoined by the brain they would have a single decoder. Ruanel: No, they have two decoders, that is to say, each thetan needs a mental decoder to embody. Interlocutor: What happens is that I received an email in which there was a case of a single head with two bodies, and in the tests it was seen that two bodies were sharing a single brain. Ruanel: In that case it is a single thetan. Interlocutor: Two bodies for a single thetan? I mean If one of the bodies has a thetan incorporated, let us say in the area of the heart, Is the other body dead? Ruanel: Not necessarily, because the spirit can animate two bodies, as long as the nervous system of that decoder be distributed in both bodies. After all what gives life to the physical body is the decoder. two decoders = two thetans. There are cases of twins that have a single body, two hands, two legs, two heads, and two thetans. Interlocutor: Is it clear, to clarify a little more this issue. Here I have a picture that you surely perceive, of two people that are conjoined by the brain. In this case they do have two decoders and two thetanes? Is it correct? Ruanel: If there is a single head, it is a single thetan. Interlocutor: But here I see two heads. Ruanel: One head=One thetan; Two heads=two thetans. Interlocutor: Okay. The note I received was this: "After having watched on the Discovery Channel the program titled “Extreme Bodies” about two bodies conjoined by the skull and the tests showed that they shared a single brain, you should have to see the report, and like you say, I understand that we are 10% incarnated, I was wondering why those so strange cases exist and how the Grupo Elron evaluate the topic of the decoder, How can it be that in a single decoder be two spirits? Would it be explainable? That is all my doubt". Ruanel: If it is a single brain, it is a single thetan. It’s not necessary to complicate things. Interlocutor: Let’s see if I understood. In the case of a single brain there is a single thetan that animates two bodies. Is it correct? Interlocutor: That is to say that the 10% spirit can be in either of the two bodies? Or does it jump from one to another? I ask it because we know that the 10% is located in the area of the heart and not in the brain. Ruanel: In fact the thetan doesn't incorporate like you incorporate liquid to a bottle. Ruanel: The thetan is supraphysical. The supraphysical being can perfectly fit in both heart chakras. Interlocutor: Now I understood perfectly. I misunderstood this issue. Ruanel: The difficult thing is the other way around: when there is a single body and there are two heads. there are two famous girls, and this case is more difficult because both thetans have to agree to coordinate the movements. Interlocutor: That is to say that in this case there are two thetans in the heart chakra? I mean in the case of two brains and a single body. Interlocutor: Well, the physical issue on this matter is perfectly clarified, but what about the origin of this anomaly? I mean if there is a genetic accident, simply chance, karma, etc. Ruanel: It can be genetic-karmic; it can be genetic-engramic. Interlocutor: My question is based on a book written by the spiritualistic medium Ercilio Maes and dictated by a spirit called Ramatis, in which the famous case of the conjoined twins Chang and Eng Bunker was due to “Karmic Justice” because in previous lives they had fought without reconciliation and in this way, they had to depend on each other. Ruanel: What you are saying It’s very childish! Interlocutor: How so, Master, it seems quite logical? Interlocutor: Wait a second, Master, let us suppose that Jorge and I embody life after life and we fight "to death" without reconciliation, why wouldn’t we embody as conjoined twins to get along with each other? Ruanel: But would you be so cruel to embody as a conjoined twin with this vessel forcing him to withstand you? Interlocutor: I understand the joke, Master, and I believe that I gave the worst example. Ruanel: Do you imagine to this vessel wanting to go to a discotheque to have a good time and you wanting to stay at home reading? One would pull to one side and the other to the other side! Ruanel: Okay. Now remember the “karmic ties” something that Johnakan has explained before. If the subject A in one life commits a hostile act against the subject B, They don’t have to embody together again so that the Subject A, by means of a merciful act “compensates” the subject B, because the subject A is the one who has generated karma when he committed a hostile act against the subject B, The subject B doesn't owe anything to the subject A. In the case of two persons that throughout several incarnations have fought fiercely, if they had to embody “together”, they wouldn’t necessarily learn the karmic lesson because they could get along with each other or hate each other or play the role of victim saying: "Why did God send this to us? ", since the one who ignores the spiritual world spiritual sees an illness like a punishment and not like a lesson to learn. Ruanel: Medicine has advanced a lot in this XXI century to such point that certain doctors have widened their criteria. They have recently published a note about Alzheimer saying that it can be 10% genetic and 90% due to negative habits that a person has. I find fantastic that this knowledge is given at a scientific level, because if we say it and we published in a web site, mistakenly called esoteric, they dismiss all the information, as well as they have dismissed the revelations of Johnakan and Morganel. 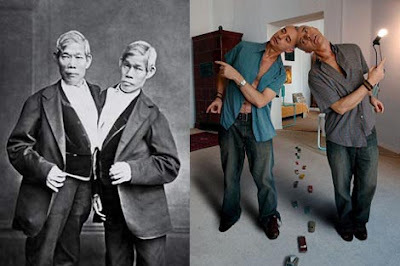 Interlocutor: Everything is clear, Master, and to conclude with this topic I want to ask you about the most famous conjoined twins who were born in Siam, in 1811, I already mentioned Chang and Eng Bunker. Which was the real cause they were born in that way? Ruanel: It was something that already came with a genetic malformation and both spirits agreed in the supraphysical plane to embody in that way. Interlocutor: But what was the reason? Ruanel: To learn between them and also to teach to their environment. Interlocutor: That is to say that they also embodied in mission. Interlocutor: One of them started to drink alcohol and died from an aneurysm and they say that the other twin died from fear. Is that correct? Ruanel: No, because one does not necessarily die from fear, but rather the organism stops working, because in fact it is an organism. Interlocutor: Is it an expression saying that he died from fear? Ruanel: You, as a biological unit in twenty years, if part of your body stops working and it is irreversible, then you don't die from fear, you die because you have an irreversible problem. Interlocutor: This means that Since the Siamese twins were a single organism; when one of them died, his death provoked the death of both of them? Interlocutor: Well, Master, I believe that the topic is over. This entry was posted at Saturday, September 05, 2009 and is filed under Medical Science . You can follow any responses to this entry through the .